NEW YORK – Attorney General Eric T. Schneiderman today announced criminal convictions and a civil resolution against two Broome County trash collection firms, Bert Adams Disposal, Inc. and Taylor Garbage Service, Inc., their owners and associated employees for conspiring to rig bids, allocate customers, and fix prices for trash and recycling services. In addition to conspiring to rig bids for private customers – which forced Broome County residents and businesses to pay artificially inflated prices for essential services – Bert Adams Disposal and Taylor Garbage Service also colluded on bidding for certain municipal contracts, inflicting significant economic harm on New York taxpayers. Taylor Garbage Service and Bert Adams Disposal dominate waste-hauling and recycling services in the Broome County area. The Attorney General’s investigation revealed that, from as early as July 2014 until May 2016, the two companies entered into collusive agreements to rig bids for waste-hauling, recycling, and related services, and forced customers to pay excessive prices for basic services. The companies conspired through in-person meetings, phone calls, and text messages. First User: Did I hear a rumor that your going to raise your residential rates? Additional texts showed that the companies agreed on when to refrain from giving a quote to a prospective customer, thus thwarting the customer’s attempt to switch providers in response to exorbitant prices. Second User: 20 front st bing? Today, Elbert Adams, majority owner of Bert Adams Disposal, entered a guilty plea before the Honorable Joseph F. Cawley in Broome County Court, to the “E” felony charge of Combination in Restraint of Trade and Competition – also known as a violation of New York’s Donnelly Act. Adams admitted in court today to entering into collusive arrangements with individuals from Taylor Garbage Service to rig bids for waste-hauling, recycling, and related services. He admitted that these arrangements included, among other methods, the companies agreeing to not pursue the business of each other’s current customers and deciding in advance which company would win a bid. Adams further admitted that both companies agreed to submit a deliberately inflated bid or price quote – or not to submit a bid at all – to a customer to ensure the incumbent company would keep the contract. Adams further admitted that they deprived customers of their right to free competition and, in turn, forced customers to pay excessive prices for waste-hauling and related services. As part of his felony plea, Adams will pay $75,000 in criminal penalties. Bert Adams Disposal, Inc. also pleaded guilty before Judge Cawley in Broome County Court to an “E” felony Donnelly Act violation. As part of Bert Adams Disposal’s guilty plea, it will be required to pay $850,000 in criminal penalties. For their role in the conspiracy, company employees Bert J. Adams and Christopher Kline each pleaded guilty today before the Honorable Carol A. Cocchiola in Binghamton City Court to the “A” misdemeanor count of Attempted Combination in Restraint of Trade and Competition, and will each pay $37,500 in criminal penalties. Taylor Garbage Service, Inc. will pay $500,000 in civil penalties, and Robert Taylor, the company’s president and co-owner, will also pay a $50,000 penalty to New York State. The company also agreed to appoint a compliance officer to oversee the implementation of an antitrust compliance program. 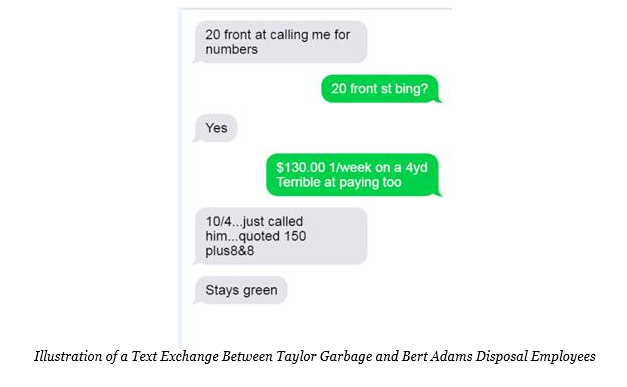 In its settlement with the Attorney General’s Office, Taylor Garbage Service admitted to violating New York State’s Donnelly Act by, among other methods, routinely agreeing in advance with Bert Adams Disposal which company would win a particular bid, regularly submitting deliberately inflated bids and price quotes to prospective customers to ensure that the incumbent would keep its customer, and regularly exchanging information about rates they were charging customers and would be submitting in bids. 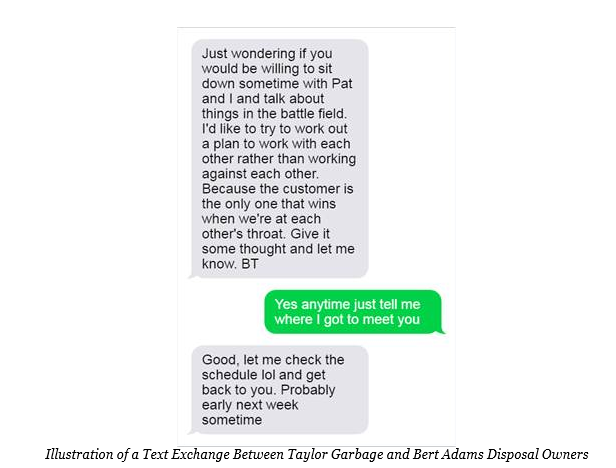 The terms of the settlements with Taylor Garbage Service and Mr. Taylor reflect the company’s early confession of its responsibility for the anticompetitive conduct and its prompt cooperation, including the disclosure of critical information in furtherance of the Attorney General’s investigation. 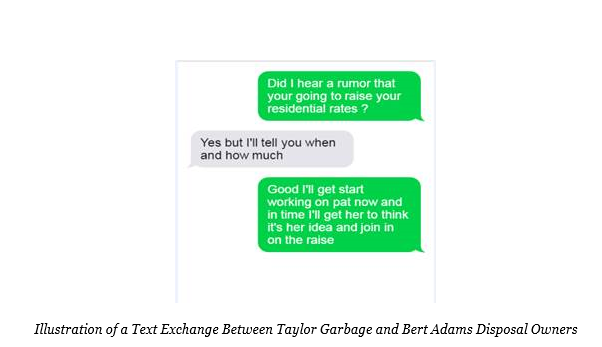 Click here for the settlement agreement with Taylor Garbage Service. This matter was handled by Antitrust Bureau Assistant Attorneys General Irina C. Rodríguez and Zachary W. Biesanz with assistance from Analyst John Ferrara of the Department of Research and Analytics, under the supervision of Bureau Chief Beau Buffier, Deputy Bureau Chief Elinor Hoffmann, and Executive Deputy Attorney General for Economic Justice Manisha M. Sheth. This matter was also handled by Assistant Attorneys General Mary Gorman and Bridget Holohan-Scally of the Public Integrity Bureau, under the supervision of Public Integrity Bureau Chief Daniel Cort, Deputy Bureau Chief Stacy Aronowitz, and Executive Deputy Attorney General for Criminal Justice Margaret Garnett. The investigation was led by Criminal Investigator Joel Cordone and Supervising Investigator Richard Doyle of the Criminal Enforcement and Financial Crimes Bureau, under the supervision of Deputy Chief Antoine Karam and Chief Dominick Zarrella.